The AFL-CIO, whose president Richard Trumpka speaks to the White House everyday, is working hard to keep the Wisconsin protests going. The New York AFL-CIO unions have been busing in reinforcements to Madison. Unfortunately, not all of the reinforcements brought shoes. New York is just one state that is busing in supporters to help the leftist protesters in Wisconsin. The Wisconsin workers who have staged a week-long protest against their union-busting governor are getting some New York reinforcements. Teamsters Local 237, which represents various city workers, intends to “bus a couple hundred” members to Madison – possibly this week, deputy director Pete Gutierrez said. Transport Workers Union Local 100 also will send “a leadership delegation immediately, with the potential of a larger group shortly after,” union chief John Samuelsen emailed. 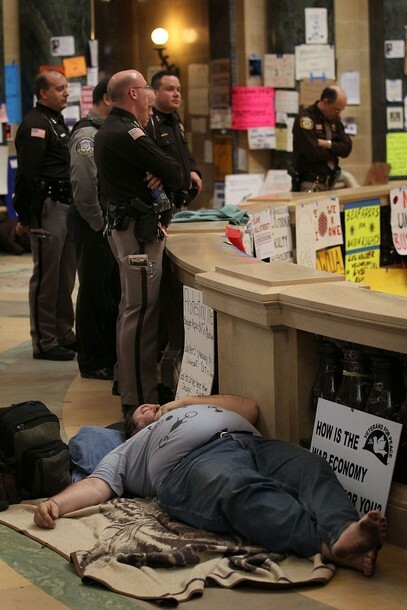 The standoff in Madison erupted last week after Walker tried to get the GOP-dominated state Senate to pass a bill to force government workers to chip in for their pensions and health insurance – and deny them the right to bargain for better working conditions.